Health Canada is making warning stickers and patient handouts mandatory with all dispensed prescription opioids dispensed, and the final regulations were published Wednesday in Canada Gazette. 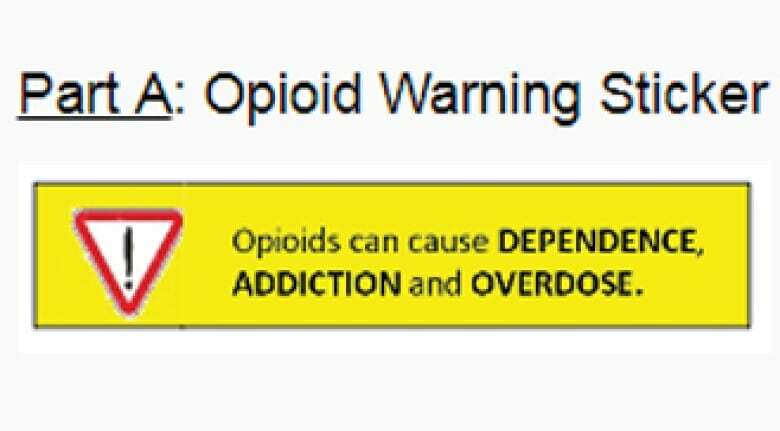 The bright yellow warning sticker will say the opioid medication can cause dependence, addiction and overdose. The stickers will be applied to each container that’s given to the patient. The signs of opioid overdose. Warnings such as not to share the medication. Always store the medication safely out of reach of children. It will also advise of other serious warnings and potential side-effects. The mandatory warning sticker and the patient handout will be distributed starting in October. The stickers and handout are part of the government’s response to the opioid crisis, but there is no silver bullet, said Dr. Supriya Sharma, Health Canada’s chief medical adviser. “What we’d heard from patients and practitioners is that there were a lot of people that were going and getting their prescription filled not even knowing that the medication they were getting was an opioid,” Sharma told reporters. The handout is meant to be a clear, concise single page that offers consistent information across the country on the risks of opioids, Sharma said. Under the new regulations, pharmaceutical companies will need to develop and implement mandatory risk management plans to help describe, monitor, prevent and manage risks associated with the use of their opioid medications. The risk management plan could include training sessions for physicians and other health-care practitioners as well as a registry to monitor adverse events, Sharma said. Health Canada says this is the first time the federal government is requiring a warning sticker and patient handout with a medicine dispensed by a pharmacy. Under Vanessa’s Law or the Protecting Canadians from Unsafe Drugs Act, the federal government can require pharmaceutical companies to have risk management plans. Under those plans, the companies must collect and monitor information about the use of their products, including finding ways to reduce harm associated with use of the drugs. Canadians are the second-highest users of opioids per capita in the world, after the U.S.
Sharma said much of the opioid crisis can be attributed to contaminated drugs that have been obtained illegally, but prescription opioids have also contributed. “This is like basic first aid and should be available to all,” Schulz said.